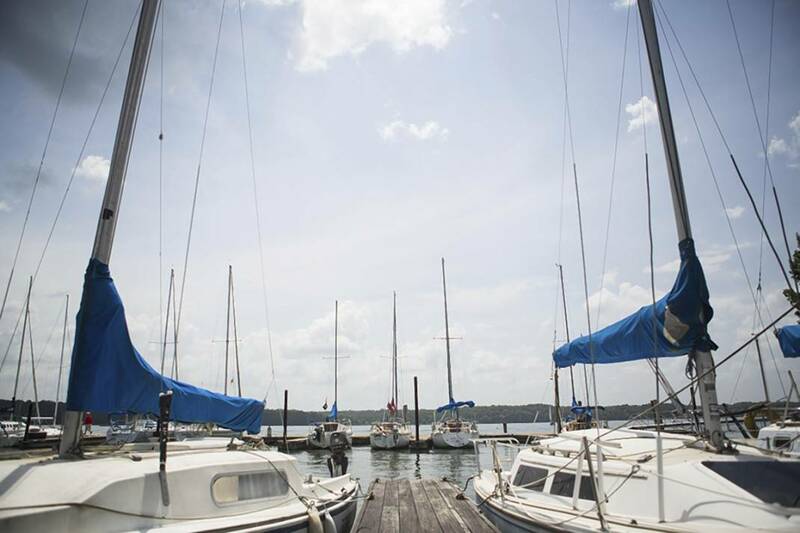 The Privateer Yacht Club, which is located on Chickamauga Lake in Hixson and recently celebrated its 75th anniversary, has helped make sailing a Chattanooga activity for decades. Four times a week, the club hosts races the public is invited to watch. In the past decade, Chattanooga has made its name as an outdoors sports destination. From climbing to kayaking to triathlons to paddleboarding, the Scenic City has gained notice around the nation for outdoors enthusiasts — even twice earning Outside magazine's award as the best outdoors city in the United States. It would be easy to think that this love of outdoors activities is something new brought to town in the 21st century by younger adventurers. But more than seven decades ago, the Tennessee Valley Authority helped create one of the older outdoors sporting clubs in town. The Privateer Yacht Club celebrated its 75th anniversary on July 25, and the club has been getting people active and on the water since before the United States entered World War II. "It started after the Chickamauga Dam was built," Keith Harper said. "When the dam filled the Chickamauga reservoir, there were some folks around here who knew a little bit about sailing, and they started sailing a boat called a snipe. Privateer Yacht Club member Pete Snyder rigs his boat for a day of sailing. "It kind of grew from there. It was fortunate that the dam was built. It gave us a big enough area to sail in." Harper has only been involved in the sport for three years since taking a sailing class at Chattanooga State. He quickly developed a love for the sport and for Privateer Yacht Club, where he now serves on the board and as the club's social director and as an instructor for new sailors. "I had never been on a sailboat before I took my first lesson, and I wondered if I'd even be able to handle a boat," he said. "Within just a few weeks I was learning the basics, so it's a sport anyone can participate in." The club remains active for much of the year at its clubhouse on Chickamauga Lake in Hixson, with keel boat races on Saturdays and Wednesdays and racing for smaller sailing dinghies on Sundays and Thursdays. Everyone is invited to watch the action — and perhaps get involved. "The public is welcome to come out for any of our open races, but primarily on Saturdays and Sundays," Harper said. "People can observe or they can even take part in the races. "Some boats are very competitive but there are some people who have boats who will welcome people on the boats so they can take part and see what it's all about." For those who want to learn more, Privateer hosts a youth sailing camp that introduces the sport to 200 to 250 kids every summer. The club also conducts also adult sailing classes at Chattanooga State and boat safety classes in conjunction with the Tennessee Wildlife Resources Agency. On Aug. 15, Privateer will host its annual Dog Regatta, and on Sept. 30 the club will host the national masters championships for racing MC Scow boats — with 50 to 60 boats from around the United States expected. For Harper and his fellow Privateer Yacht Club members, the excitement of using the wind to race boats makes sailing a sport that keeps them coming back — as the club has kept people coming back for the past 75 years. "Sailing for me is pure science. You're attempting to harness nature," Harper said. "We don't use engines, but we use science and nature to make the boat go as fast as possible. "When you have good wind, it's really invigorating to know that you're using nature to make the boat go fast." Contact Jim Tanner at jftanner@bellsouth.net. Follow him at twitter.com/JFTanner.